Lalcafé Yeast exhibited at the International Coffee Week for the first time together with Laboritori Farroupilha (Plant care). Lalcafé Yeast compliments Laboritori Farroupilha’s offering of plant care bio-solutions. 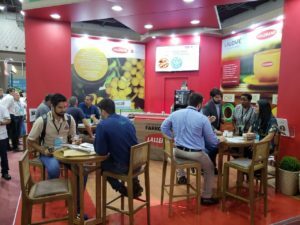 Laboritori Farroupilha is well positioned to distribute the Lalcafé Yeast Range as they already service the coffee farmers in Brazil from a plant care point of view. The coffee fermentation is a subject that is currently trending in Brazil and farmers are keen to understand how to use the tools we are offering to their advantage given their current set up. We interacted with many potential customers and existing ones during the show. We are excited about the partnership we will have going forward as we work hard to support Brazil’s coffee growers. ← LALCAFE INTENSO WINS BEST NEW PRODUCT AT SCA SEATTLE 2018.